This is my first livery. I am an Airwolf enthusiast and I wanted to make a Santini air livery for the X-PLANE 10 default jetranger. UPDATE: 24 May 2011, Livery png now modified so that bear paws and radome are now correctly omitted for this particular aircraft. For convenience you can load up the Radome or Non-Radome BK117 but it will be the same aircraft now with the bear paws and radome deleted, but showing the wire cutters in place. This is the livery of D-HBKC, construction number c/n 7001, the first production machine off the Donauworth line in 1982. It was test flown by chief-test pilot Siegfried Hoffmann and flight-test engineer Walter Sinn on 23rd April 1982 in Ottobrunn. For a time it was the factory demonstrator before changing ownership within Germany a number of times. Finally it was bought by Transportes Aéreos Pegaso in Mexico, where it remains in use today. Oddly, in addition to owning the first BK117 off the production line, Pegaso also bought the last BK117 made, XA-UBP c/n 7555 in 2004. They still own and operate both. UPDATE: 24 May 2011, Livery png now modified so that bear paws are now correctly omitted for this particular aircraft. For convenience you can load up the Radome or Non-Radome BK117 but it will be the same aircraft now with the bear paws deleted. This is a fictional livery, based on the Robbe-Schluter scale fuselage for 90-size radio controlled helicopters. Lettering added for effect. This is a fictional livery, based on the Robbe-Schluter scale fuselage for 90-size radio controlled helicopters. This is the livery of the BK117 prototype, P-2, which has now been updated with the removal of the landing gear step. P-2 was the only BK117 to not have this step. This can be used in either the radome or non-radome model. The original P-2 is now in the Helicopter Museum in Buckeburg, Germany. 1. This is one of the first liveries I did, uploaded due to interest for UK liveries. This aircraft was the 47th machine off the Donauworth production line in 1984 and was pressed into service as another factory demonstrator, exhibited at the Paris Air Show at Le Bourget on 11th June 1987. Conveniently, it was displayed in the same colour scheme that the BK117 EMS mock-up was displayed in at the same airshow just six years earlier. Simply unzip the file "CN 7056 OO-XCY" into your xplane/aircraft/helicopters/bk117/liveries folder. This is the livery of OO-XCY, construction number c/n 7056, the 56th BK117 off the production line. This livery was seen on it in 1989, when the aircraft was operated by Heli-Samu in Belgium, which was sponsored by the state airline Sabena at that time. Simply unzip the file "CN 7056 OO-VCY" into your xplane/aircraft/helicopters/bk117/liveries folder. This is the livery of OO-VCY, construction number c/n 7056, the 56th BK117 off the production line. Prior to 1989 the Belgian rescue company Touring operated in several regions of Belgium with regional markings. This livery is that of Touring-Secours. Simply unzip the file "CN 7056 OO-XCY2" into your xplane/aircraft/helicopters/bk117/liveries folder. This is the second livery of OO-XCY, construction number c/n 7056, the 56th BK117 off the production line. Prior to 1989 the Belgian rescue company Touring operated in several regions of Belgium with regional markings. This livery is that of Touring-Wegenhulp Secours. This aircraft was the 9th machine off the Donauworth production line in 1984 and was pressed into service as another factory demonstrator, as seen at Hannover on 20th May 1984 in the photos enclosed with the livery. Now one of the ADAC fleet. This aircraft was the 184th machine off the Donauworth production line and has the distinction of being the most-displayed factory machine, being shown at Farnborough in 1990, 1992 and 1994. Although it is in a very plain paintscheme, I have included it because it is the only example I have found displaying the MBB Aerospace logo. Today it is one of the ADAC fleet. UPDATE: 24 May 2011, Livery png now modified so that bear paws and wire cutters are now correctly omitted for this particular aircraft. For convenience you can load up the Radome or Non-Radome BK117 but it will be the same aircraft now which will show radome only. This aircraft was the 7th machine off the Donauworth production line, and was immediately upgraded to B-1 status and registered as D-HBKI and then D-HXXL (http://forums.x-pilo...hp?topic=2294.0). It has had a chequered history, having been registered since in France and Mexico, before being leased into the SAR market in Italy. It got its unique paint scheme after Glasurit commissioned celebrated German painter/designer Walter Maurer in 2000 to come up with the design it now wears, which he named "Flying Colors." Interestingly, 7007 was the C-1 testbed, fitted with the new Turbomeca Arriel-1-E turbine on 6th April 1990, going on to icing tests in Vienna in February/March 1991, and high temperature testing in July 1991, the LBA C-1 Type Certification being awarded on the 20th October 1992. Updated 01Jun11 - added updated interior, bear paws removed. Updated 29Oct11 - corrected an error on the top and bottom edges of the inner fin surfaces. BK117 B-2/D-2 c/n 1089 ZK-HKZ, BK117-850D2 STC "Airwork"
This is the livery of ZK-HKZ, construction number c/n 1089, (all Kawasaki-built BK117s had c/n's beginning with 1xxx), an important and unique machine in the BK117 timeline over the last thirty years. This particular machine was the testbed machine in 2009 for the Supplemental Type Certificate (STC) which was an evolutionary development of the BK117, carried out by Airwork in Ardmore, New Zealand. Fitted with the new Honeywell LTS101-850 turbines which gave the BK117 a large increase in performance and power, in both normal use and in OEI situations, this brought the BK117 up to date and made an already reliable and efficient machine even more so. As the BK117 C2 is the brand description used by Eurocopter & KHI for the EC-145 in the Australasian and Far East market, the designation BK117 D-2 marks that this is a true BK117, not an EC-145 derivative. This livery was used to promote the aircraft's development and this particular machine now serves as one of the Westpac fleet in New Zealand. I am grateful to Richard Pitt of Airwork, without whose assistance this livery would never have been made. UPDATE: 24 May 2011, Livery png now modified so that bear paws are now correctly omitted. For convenience you can load up the Radome or Non-Radome BK117 but it will be the same aircraft now with the bear paws deleted. I've updated the Tiger livery, so that it now has the bear paws removed and has the updated seats. Note: This is for the Non-Radome version. This is the latest in my series of BK117 liveries. I can't say with certainty very much about this aircraft, VH-FHB (c/n 1056, built 1990) and its twin, VH-FHF (c/n 1093, built 1991). Both are identically painted, with FHB numbered 225 on the tail, and FHF numbered 226. I've seen these two aircraft described as owned by Altitude Aviation, NSW Fire & Police, and also by Helitreck Aviation, so I'm guessing here. As they are both Kawasaki-built in Japan, I have no details of their history or heritage. However, there is a nice video of these two BK117s on Helitreck's website , but I don't know if they are still trading. This livery is designed for the radome version. The png file leaves the wire cutters displayed, but hides the radome and bear paws. Just extract it to your xplane/aircraft/helicopters/bk117/liveries folder. This is the first to have the correct door handle signs, fuel cap logos and a new interior. This is the livery of D-HBNE c/n 7057, the 57th machine off the Donauworth production line in 1986. In November 1987 it was the project aircraft for the B-1 type certificate application from the German Aviation Authority (LBA) at Ottobrun. Afterwards it was yet another which became a factory demonstrator, exhibited at Farnborough on 4-11 September 1988 & 5-12 September 1990. For most of its life, HBNE has been an F1 Grand Prix VIP shuttle and corporate hospitality helicopter, operated by LGM Luftfahrt GmbH in Mannheim. It is currently the Arch 9 EMS ship, N990SL, for Litchfield, Illinois. Use with the Radome version, bear paws & cutters are switched off. Includes updated seats. Simply unzip the file "CN 7123 LifeAir 2" into your xplane/aircraft/helicopters/bk117/liveries folder. This is the livery of N399MA c/n 7123, the 123rd machine off the Donauworth production line in 1987. It began life as Life Air One, based at Schumpert Medical Center, Shreveport, Louisiana from 1987-1993 (see below). 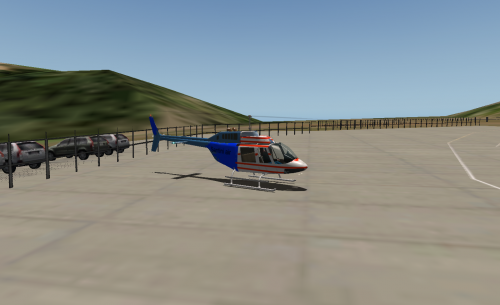 On November 15, 1993, Life Air Rescue was created by the merging of Schumpert's Life Air One, and Willis-Knighton's Air Rescue, and the old Life Air 1 got a repaint in the colours they still use today. This aircraft operated from 1993 until 1997 in the livery you see here, when it was replaced by the now-familiar EC-135, and is now N117CH, the Atlanta Children's Healthcare helo. Use with the NON-Radome version, bear paws are switched off. Simply unzip the file "CN 7123 LifeAir 1" into your xplane/aircraft/helicopters/bk117/liveries folder. This is the livery of N117SM c/n 7123, the 123rd machine off the Donauworth production line in 1987. It began life as Life Air One, based at Schumpert Medical Center, Shreveport, Louisiana from 1987-1993, in the livery represented here. In November 1993, Life Air Rescue was created by the merging of the Schumpert and Willis-Knighton air meds, and the aircraft was repainted as above. This aircraft was replaced by the now-familiar EC-135, and is now N117CH, the Atlanta Children's Healthcare helo. Simply unzip the file "CN 7137 UMASS" into your xplane/aircraft/helicopters/bk117/liveries folder. This is the livery of N118LF c/n 7137, the 137th machine off the Donauworth production line in 1987. It used to be the EMS ship for UMASS Memorial Hospital, as seen here. In 2009 it was replaced by an EC-145, and transferred to Germany where it is now D-HIMU in the DRF fleet. Simply unzip the file "CN 7074 D-HBNV" into your xplane/aircraft/helicopters/bk117/liveries folder. Photographed at LSEZ Zermatt on 30 June 1988. Olympics were held in Seoul, South Korea from 17 Sept 88 to 2 Oct 88, so D-HBNV must have been in attendance. Of note, it was in the same colours and registration on 13th October 88, so it is likely it attended as a "guest" rather than an owner transfer. More probable is that MBB used the event as a public relations opportunity to show off the BK117, which would explain the Olympic rings on the livery. The aircraft is now Christoph 1 of the ADAC fleet in Munich, Germany. This is a fictional livery I created as my personal livery, but I wasn't happy with it and was going to consign it to the "never used" folder. As at least one person likes it, I thought I'd post it up instead. Simply unzip the file "CN 7042 HB-XOZ" into your xplane/aircraft/helicopters/bk117/liveries folder. This is the livery of HB-XOZ, which identifies it as airframe number 7042. I can tell you nothing about this machine, other than it was pictured in July 1986 in these colours, and was one of the Rudisuhli Heli Group fleet. I believe RHG disappeared many years ago. Last records show this machine is now in the US.